Effectively planning, managing and communicating your team’s shifts can be like trying to complete a 5000 piece puzzle without knowing what the big picture looks like. You need to ensure that you not only have coverage but have the necessary skills to operate your businesses successfully. Your business—like each of the employees you are looking to schedule—is unique, with its own set of goals and challenges. However, there are some cross-industry best practices that you can apply to improve your shift scheduling efficiency, visibility and employee happiness. 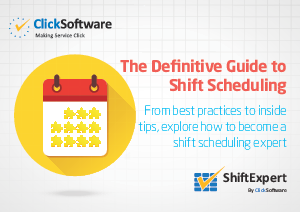 Download this guide which will walk you through the various stages of shift scheduling: understanding your needs, building, communicating, managing, tracking and reviewing.